The Birthplace of America’s Music - Mississippi Believe It! Born in the Delta, the Blues was discovered by W.C. Handy in a Tutwiler train station while listening to a man singing and using a knife to play guitar. The Blues, in turn, gave birth to Jazz, R&B and Rock ’n’ Roll – the staples of popular music. Born in Meridian, Jimmie Rodgers, “The Singing Brakeman,” yodeled his way to greatness in the 1920s and became one of the first country music superstars, earning the indisputable moniker of the Father of Country Music. Born in Tupelo, Elvis Presley rose to the summit of stardom through sharing his unique interpretation of Mississippi’s indigenous music – and hip- shaking magnetism – with adoring fans worldwide. Scoring the soundtrack of life for over 100 years. 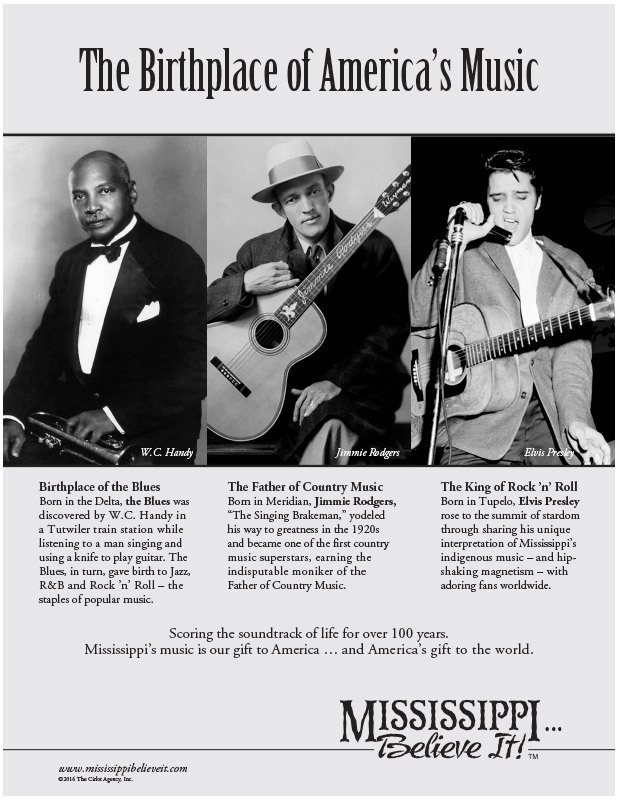 Mississippi’s music is our gift to America … and America’s gift to the world.